The Human cultures of the Universe irrespective of its technological complexity- have built up their own medical system that help people to cope up with inevitability of sickness, just as all cultures have religious avenues that deal with the inevitability of death. Medical anthropology tries to understand the concept of health and illness in societies. It also tries to correlate between two absolute truths of life through the cultural point of view. Cultural dimension is a junction point where medical anthropology gets divergence from the mere conception of medical science. The tribal inhabiting in the various parts of the world have their own cultural explanatory model regarding the understanding to health and identifying the causes of various ailment. 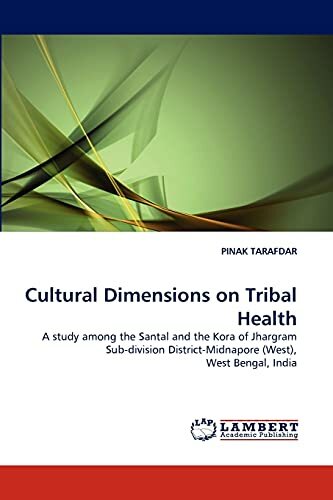 In the present book an overall discussion on the cultural dimensions of tribal health is made with special reference to the Stantal and the Koras resided in the Jhargram sub-division of District Midnapore (West), West Bengal, India. Dr. Pinak Tarafdar passed M.Sc. (First Class) and obtained Ph.D. in Anthropology from University of Calcutta. Presently he is working as an Assistant Professor in the Department of Anthropology, University of North Bengal, India. His special area of research interest is Medical Anthropology.